Welcome to my UK homebrew website, my name is Dave; I am a keen beer, lager and winemaker from Co. Durham. I am also known as Horden Hillbilly on a few beer forums. This site is not meant to be a definitive guide on brewing; it is merely a simple, straightforward way of sharing my brewing experiences, showing that it is possible to make quality home brew easily, at a fraction of commercial prices. Hopefully visitors will pick up a few tips and enjoy sharing my hobby, however please feel free to adopt your own brewing methods or vary my methods if you wish to do so. I started brewing beer using kits in 1981; the first equipment I bought was a fermenting bucket, a pressure barrel and a plastic mixing paddle. I soon realised that I would soon run out of beer with one pressure barrel and quickly bought a second one! 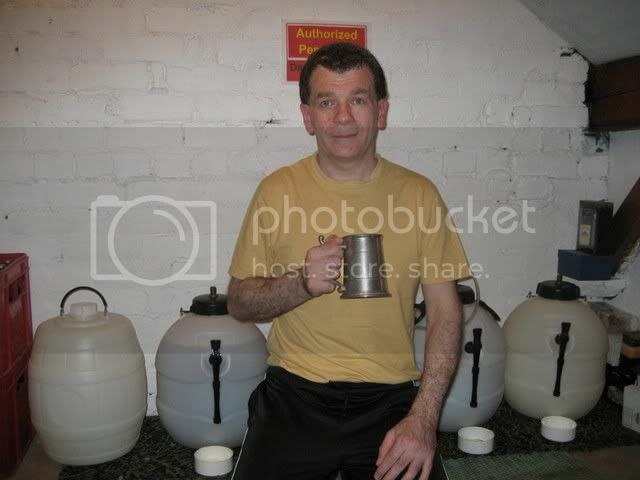 I married in 1983 and as my wife is a lager drinker we needed another two pressure barrels, I also bought a couple of demijohns and started winemaking using kits. I continued with this for a good few years and was fairly happy with the results, but at the same time I often wondered how easy (or not!) it would be to make a beer which would compare with real ale. I toyed with the idea of brewing from malt extract or all grain for a good few years, I bought both the CAMRA books "Home Brewing" and "Brew your own real ale at Home", read them from cover to cover several times, but still did not take the plunge. The turning point came in 1995 after I attended a homebrew expo at nearby Newcastle, I was able to speak to many knowledgeable people and view the various equipment and ingredients needed, a year later I bought an all grain set up, bypassing the malt extract stage. Once I had a few all grain brews under my belt, I was making beers and lagers that I was proud of, while there is no doubt in my mind that kits have come on in leaps and bounds over the years and I still use them myself occasionally when I am pushed for time, nothing compares with the quality of an all grain brew, you also have the satisfaction that it is all your own work from start to finish. Regarding wine kits, they have also vastly improved in quality and you will be able to find a style that will suit your tastes without any problem. I also now have two, five gallon wine fermenting buckets with four inch screwcaps which airlocks can be fitted to. On the following pages I will share my experiences of homebrewing. I will show a few different methods on each brew, such as making a yeast starter, bottling and barrelling my brews. I hope you enjoy viewing my website and if you have any brewing related queries please visit the forums on Jim's beer kit, this can be found on the links page. I post on there myself along with many other experienced brewers; this is a great place to share tips and advice. All the information given on this website is from my own personal experiences and are well tried and tested. However, if you try something you have seen here and it does not work out, I accept no responsibility for any loss, damage or injury that may occur.